100/365 – “On the Go” nr.11, a photo by Luca Rossini on Flickr. Day One-Hundered! Working on a 365 for the second year in a row is all but easy (some times I feel more trapped than anything), so I must say I’m glad that almost a third of the project is now done. On the other side this 365 is very different from the last one, enclosed (and productive) as it is between the boundaries of the monthly themes. Sicilians are serious when it comes to food, to colors, and to beautiful arrangements. All the senses are constantly thrilled in this land, and when it is not for its majestic landscapes or the smells and colors of its fields, it is because of the job that Sicilians have done for the last thousand of years. Towns are incredibly beautiful and often impressively preserved, bars and restaurants are always an experience, and the shop windows are just an enjoyable pause between culture and food. 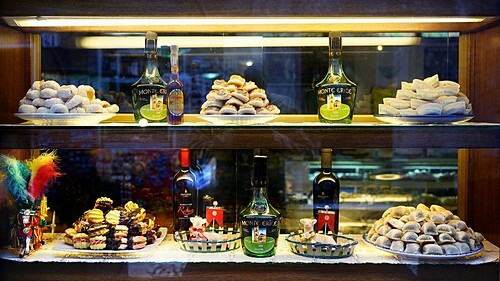 This is the shop window of a bakery in Erice, showcasing some of the typical sweets and drinks of the area. I’ve done just a little post-production here, with Photogene: I added a bit of sharpening and brushed some dodge in the darkest spots. But colors and contrasts are those produced by the RX1.